Score your cardstock in half to make a 4.25in x 6.5in card. Cut the hearts pattern side of the paper 4in x 4.5 in. 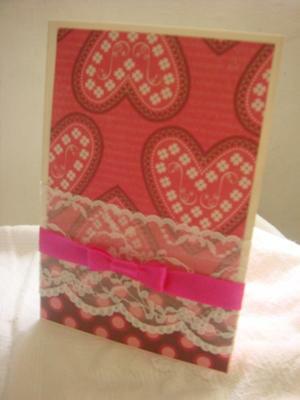 Adhere to the top part of the card, leaving a small white space from the base to serve as border. Cut the polka dots pattern side of the paper 2.25in x 4.5in. 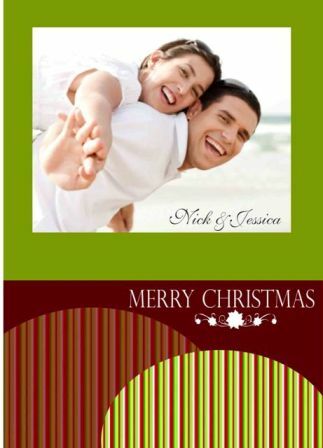 Adhere to the lower part of the card. 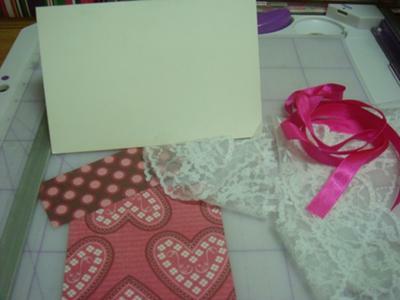 Add the lace over the papers, particularly hiding where the two papers overlap. Make a bow out of your 9in ribbon. Make sure that the ribbon will be in the center (I used my Ultimate Crafter’s Companion to help tie the ribbon). As a last step, adhere the ribbon over the lace.